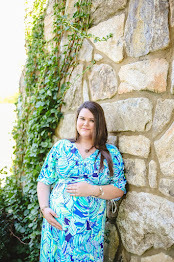 Welcome back to the blog for the last Wednesday link-up with Sarah & Emily for Friday Favorites! 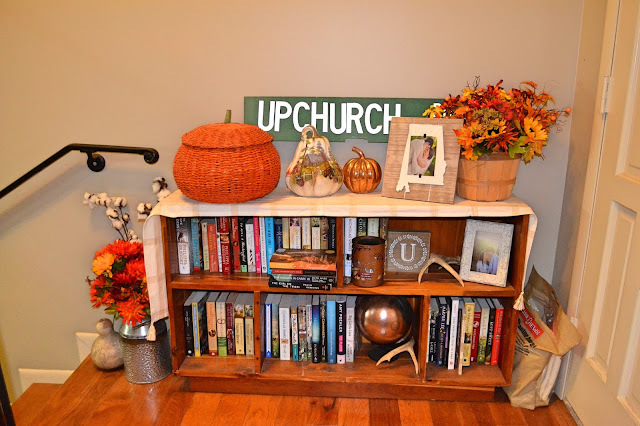 Today's link-up is showing off our Fall decor, so today I give you my Fall home tour. When you come in our front doors (which I'm not showing much of because they're about to be painted!) you'll see my Auburn door hangers. 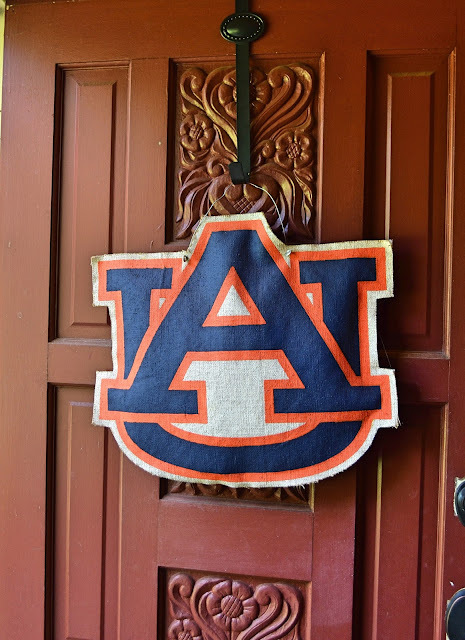 These will hang up until about the middle of October and then I'll swap them out for pumpkins that say welcome on them...until then, War Eagle! When you first come in you'll see our initial pumpkins and my sign that says, "Come in and sit a spell." This is my current setup for our front foyer area. I need to add a mirror or picture of some sort over the bookshelf (the shelf is one my dad actually built when he was much younger!) but I'm waiting to find the perfect piece! Most of my decor is from Hobby Lobby or Kirkland's, the large pumpkin actually belonged to my mom & I'm so glad she gave it to me because it's one of my favorite Fall pieces! 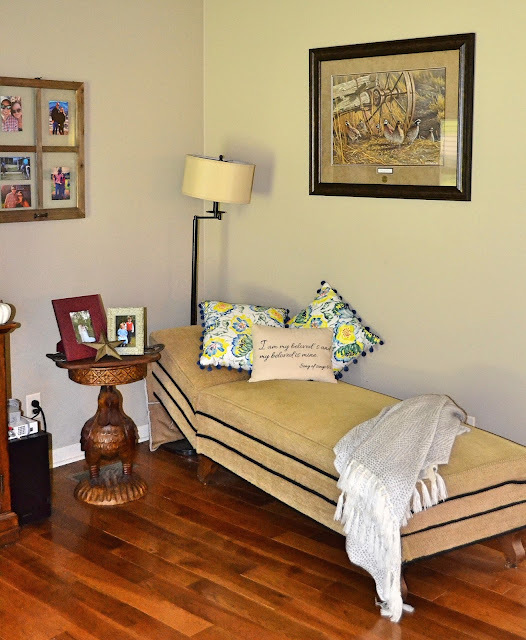 This little corner hasn't changed much since the last time you saw it, but I have added this little lumbar pillow to my antique chair and my mom gave me a little wooden U that I've added to my barcart. I keep the Fall decor in our living room pretty minimal, just a few little pumpkins scattered on the television stand & of course, you can peep my collection of candles through the glass doors. This is one of my favorite areas, which also hasn't changed much but I definitely wanted to share it because it's just so cozy. I did change up our coffee table decor for Fall with this giant platter (it has leaves around the outside) and of course some new Fall candles and pumpkins. It's not "in your face" Fall, but just enough cozy to count. This is a different set-up than I've ever done before in this area. I've been trying to figure out how I want to move around my cedar chest (ideally it wouldn't be in the living room), so right now it's spare seating next to my blanket basket. 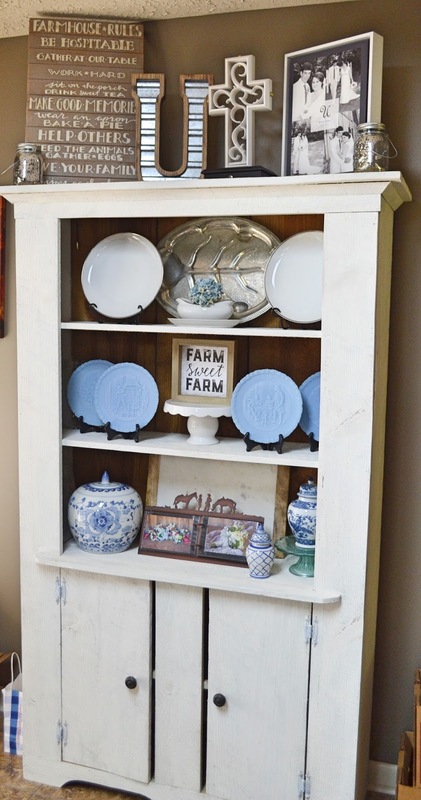 And lastly, something y'all seen peeks of before, I gave my dining room hutch a blue & white makeover for Fall...and I love it! Let me know below what your favorite parts of my decor are! You have so many cozy little nooks in your house! Thanks for linking up! Your bookcase decor is super cute! Your home is so cozy! Gosh I miss Hobby Lobby here in NY! Love the Auburn sign (yay for SEC)! Such cute decor! 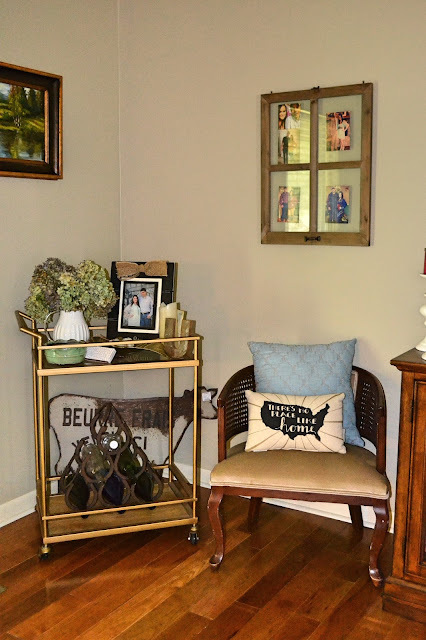 Love your bar cart and I am OBSESSED with your dining hutch! Holy cow it's gorgeous!! 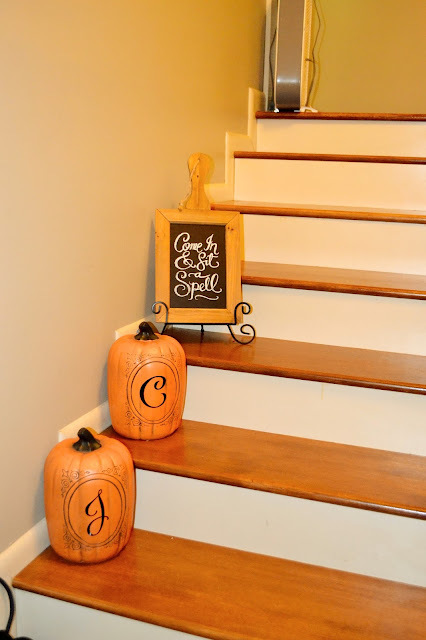 Your house looks so cute for Fall- I need to step up my game! You do a lovely job decorating. Plus I adore your floors. They are beautiful. Oh my goodness, I am LOVING all of your fall decor - what a fun home tour! You did such a great job decorating! You have such a gorgeous home! You can really see your personality and there are so many beautiful little touches that make it feel like such a loving space. 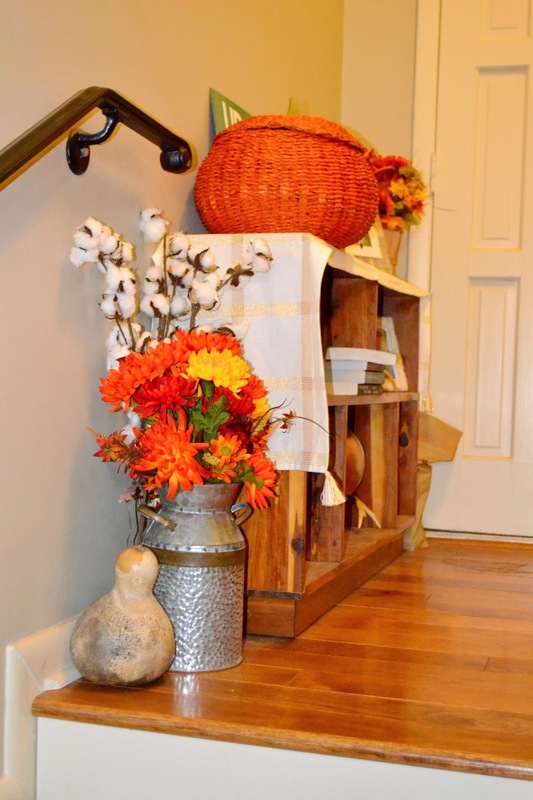 One of my favourite part of the changing seasons is the decor that comes along with it. Everything looks so good! You have a great decorating style! I absolutely love that hutch and what you've done with it. 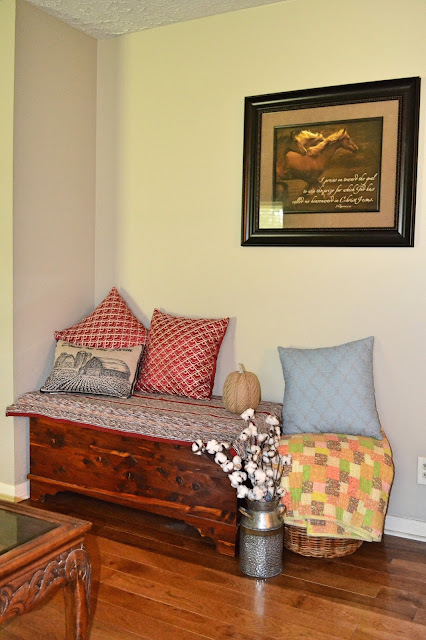 I have a cedar chest in my house too - it's hard to find the perfect place for it! Love all the fall decorations! I'm waiting until it gets closer to Halloween to decorate, but I am so excited! I love your decors, your home looks cozy and quite peaceful! Love love love your little book shelf set up! My house is not decorated for any season at all. I need to get on the fall train! Love all your fall decor!! It's so cozy! 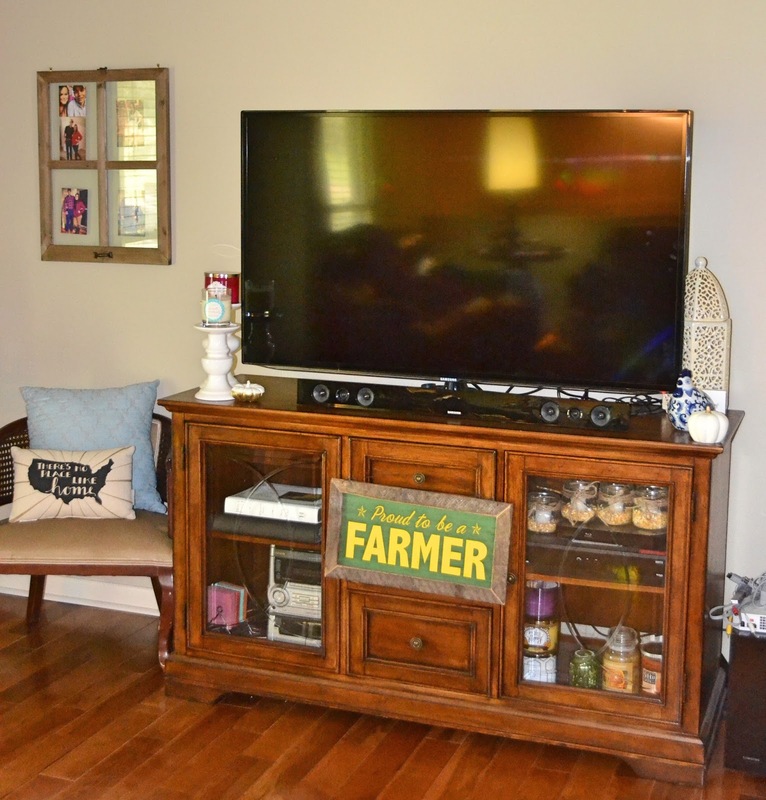 Where is your bar cart from? It is super cute! It's actually a Target bar cart, but I bought mine really inexpensively from a discount store called Dirt Cheap! 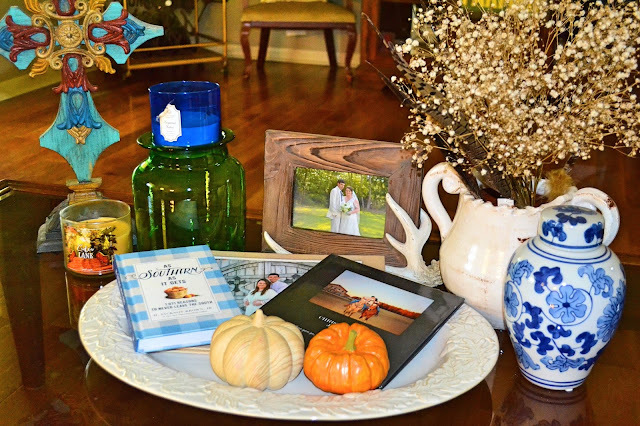 Your fall decor is cute and your home looks so cozy! I have a similar cedar chest and I'm struggling to find a good place for it! Great job getting your place ready for fall! I love these little decor ideas. I'm not into draping my whole house in seasonal decor, but I do love a few pumpkins here and there! Your home looks so cozy for fall! It's perfect!